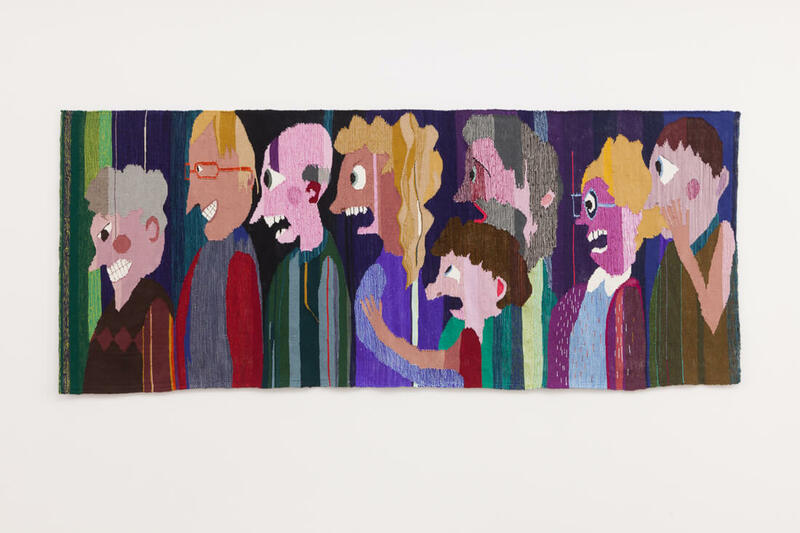 It’s hard to look at Christina Forrer‘s recent woven works — in which groups of people grin maniacally, cry, scowl, or gasp, sometimes with their hands at each other’s throats — and not imagine they are based on scenes from Trump rallies. But these works’ roots are much deeper and their pedigree much richer than the new president of the United States. Taking inspiration from the dazzling tapestries that Ernst Ludwig Kirchner and Lise Gujer made together, as well as the darkly strange narrative tapestries of Swedish artist Hannah Ryggen, Forrer creates figures with mask-like expressions and cartoonish features in a popping range of colors. But whereas Ryggen’s tapestries tended to address specific historical or humanitarian calamities, the disturbing sights causing Forrer’s figures to gawk, guffaw, and get hostile are unknown. Things are clearly bad, but exactly how or why remains unclear — and largely beside the point. As its title suggests, the Los Angeles-based artist’s solo show at the Swiss Institute, Grappling Hold, is about the act of struggling and the coarse intimacy of fighting through or over something. She offers a clue to this in the form of a historical object on loan from the Winterthur Museum in Delaware: a wood and metal toy of two acrobat figures bound to each other at their wrists, the blank expressions painted on their faces belying the awkwardness of their connection. Nearby, an untitled piece Forrer made in 2014 in gouache on linen and cotton shows three figures grinning and shouting at each other while one strangles another. The way their mouths curl up and down in mirror images of one another evokes the doubled masks of comedy and tragedy often used as shorthand for theater. Even the loosened and stretched thread used to depict the figures’ mouths formally echoes the exhibition’s themes of pushing and pulling, the literally forced proximity of coming to blows. Things get more allegorical in the show’s centerpiece, the large cotton, wool, and silk tapestry “Gebunden” (2017), which looks like a kind of stylized family tree of a particularly dysfunctional clan. Human figures of different sizes and distorted shapes wear expressions of affection, anger, or despair as they either embrace or attack each other; one, a clear allusion to Goya’s “Saturn Devouring His Son” (ca. 1819), holds a smaller person in its mouth. The striped background hues of purple and blood red amplify the air of violence. This might be the shocking scene that the figures in the nearby tapestry “Eight” (2017) are staring at with such a broad range of very intense reactions. Or it might be Forrer’s concise view of human history, a shorthand representation of where all our tugging, hugging, and throttling has gotten us.